The above info came from atomofish, and was edited by yours truly (contact me). The image came from FujiTV.co.jp. 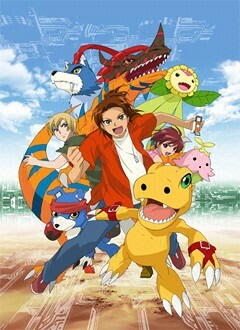 In the long-awaited fifth installment of the Digimon series, Digimon Savers focused on a tough 14-year old named Masaru Daimon, who is the self-proclaimed "best street fighter in Japan." He meets an escaped Digimon named Agumon, who is on the run from D.A.T.S, an organization dedicate to protecting Earth from invading Digimon. After fighting and acknowledging each other's strength, they become partners and members of D.A.T.S. He is teamed with two other members, Tohma and his partner Gaomon and Yoshino and her partner Raramon. As they fight they discover the mysteries of the Digital World and its mysterious ruler Mercurimon and a mysterious boy named Ikuto, who may be responsible for the numerous amounts of Digimon attacks on Earth. Note: Apparently a movie will be coming soon!